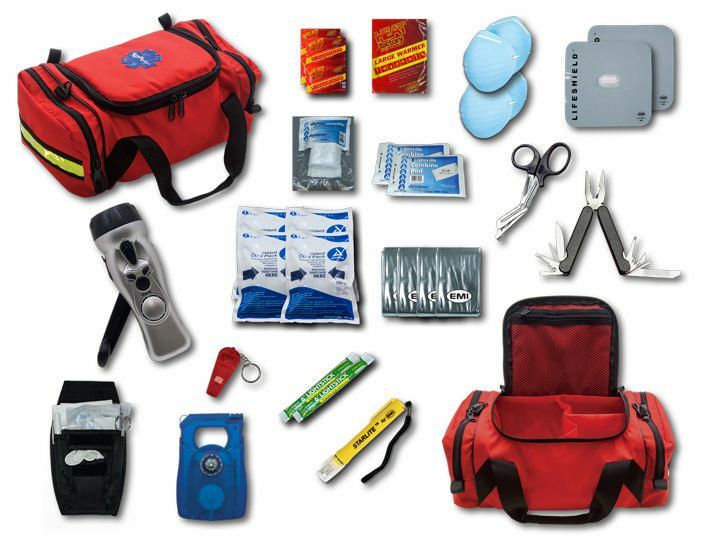 It has all the necessary equipment needed during and after a disaster situation. A valuable asset to the kit is the survivor hand-cranked flashlight that doubles as a cell phone charger that can provide up to a one-hour charge for cell phones. The nylon Cordura bag has three spacious main compartments and two side zippered end pockets. The inside top flap has a meshed zippered pocket to hold personal belongings, valuables, medicine, etc. The bag also has a carrying handle and an adjustable detachable sling. It is trimmed with a Star of Life emblem and yellow reflective trim. The Survivor Disaster Kit is a must have kit to prepare and protect you, your family, and your workers. The bag measures 35.5L X 22.8W X 15.2H cm (14 x 9 x 6").